I don’t know about your kids, but mine love to sort! They are both naturally driven toward making groupings of similar objects, lining them up or making little piles. 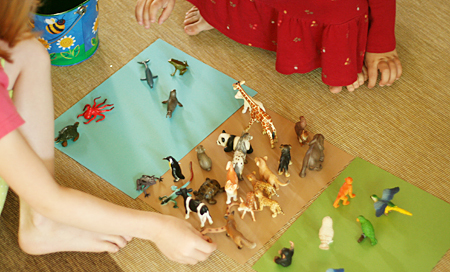 Sorting is not only fun, it’s also building those important early mathematical and scientific reasoning skills. Fun ideas! I really enjoy your blog! Neat idea! Sorting is such a great activity for improving fine motor skills/pincer grasp and helping kids understand how things are different yet still the same at any given moment. As kids are older (they can sort at around 2 but this other task takes longer) you can have them sort on different levels, such as having them sort beads that are a bunch of colors and shapes, then having them sort on the less-obvious dimension (in this case, shape) and not look at color. It’s a big developmental step to do this! I LOVE this idea. Will definitely have to try it since my 3 yo daughter loves to sort anything and everything. Thanks for sharing this idea. Thanks for this post. Sometimes I need reminders of the simple, basic things like sorting! Looking for ways to incorporate more Montessori-type activities into our play. Thanks for the reminder on sorting! It’s also good to have them re-sort items a second time to see if they can see another way the items are alike/different. I have been working on this with my pre-ks and it’s not as easy as it sounds. Many kids will pair items the second time around because they can’t quite see another way the items can be grouped. Be sure to ask how they sorted – sometimes they pick out the tiniest detail that us adults don’t even notice! I am always looking for new ways to sort things. Thanks for the ideas!